Most airline search engines on the web are interested in, above all, one thing: finding you the best priced flight. But paying the least amount for a flight doesn’t guarantee you’ll like the experience. In September I wrote about New York travel startup Routehappy’s first attempt to help customers give feedback on air travel and find the best flight experiences, like whether the airline’s crew made the flight more bearable, or whether a flight has Wi-Fi so they could get work done. 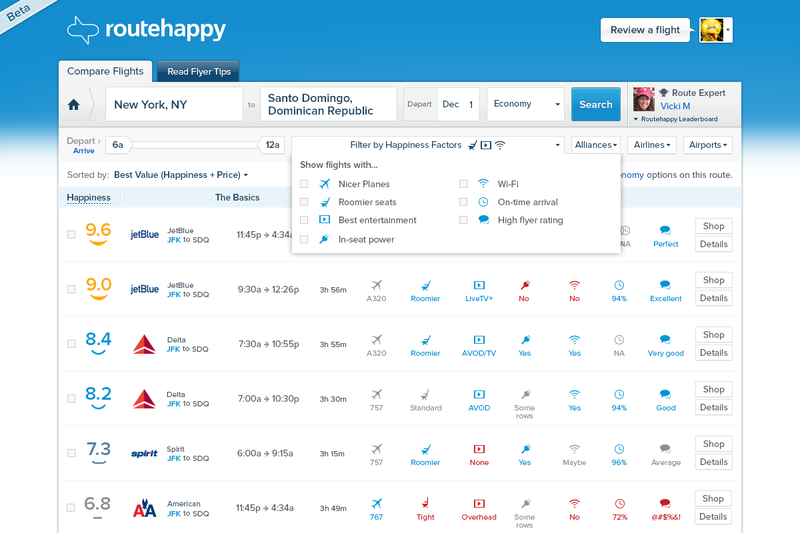 On Tuesday, Routehappy is unveiling a far more ambitious product: the ability to see reviews of almost every aspect of every flight in the world. From the timeliness of a flight’s arrival, to the quality of the crew, to seat legroom, entertainment options, food quality, Wi-Fi and electrical outlets at each seat, Routehappy is attempting to do something that no other flight search aggregator does: put all that information about every single non-stop flight in one place. CEO and founder Robert Albert and his crew of seven have been working to combine the huge amounts of data out there about commercial airlines in a way that gives each flight a “happiness score” on its website and links to go purchase that flight somewhere else. The happiness score is on a 10-point scale and shows up next to every flight listed on Routehappy.com. The scores are also color-coded and come with a happiness-level-appropriate emoticon. You can search at a glance based on the emoticon and score, or you can filter by specific amenity, like power outlets or roomiest seats. In all, Routehappy’s algorithm matches every scheduled flight in the world, and scores every component of that flight, down to whether the in-flight entertainment is a seatback video player or an overhead monitor, as well as the space measurements of first class, business class and economy seating. The goal is to help people looking for air travel to quickly make a decision based on all the pieces of data they’ve collected from around the world. The next step is sending them to a booking site. But even that act of linking all those flights is no small feat either. That’s because not every airline offers booking through its website — some only go through online travel sites, and there are some who don’t have websites at all. And that requires more work. While a flight in Burma might seem as niche as it gets, that’s kind of the point: Routehappy’s service wants to be all things to all people, no matter where you want to fly. But all of this focus on the other things doesn’t mean Routehappy isn’t going to address users looking for deals. Far from it. Early next year when the product is scheduled to leave beta, the company is adding the next, big — and possibly most important detail of them all — price. Thanks @Vincent! We’ve all been doing this research on our own for too long. It was very rewarding to pull it all into one place and showcasing the entire flight experience. We’re looking forward to hearing your feedback on the site and/or your latest flight reviews.